When it comes to building out a business software system, we’ll look at the fields and data we capture, the automatic activities to perform, and the reports we want to generate at the end of the day. But… none of this will matter without the users performing their daily activities and inputting into the software. This is why a carefully planned workflow strategy is so important! In this blog we’ll discuss the different ways we look at workflow here at Apptivo, and break down which workflow approaches fit best into each scenario. A series of actions taken by both the system and the user to complete a process. This means our workflow strategy will consider what everything from what device a user will login from, where we expect them to go in the app to find work, how they should update their work, and what the system should do to drive the next step. We should also be considering the roles of each user, technical expertise of our administrators and users, and return on investment for tracking information in the system. For the context of this guide, we’re going to analyze the business workflow, and user workflow. The business workflow defines what is occurring from end-to-end, while the user workflow describes how users will perform the steps required of them within the business workflow. Our services team focuses on identifying business workflows as proactive or reactive. A proactive business workflow is designed where the system has a clearly defined set of activities, and a timeline they should be completed by. The system will now drive notifications and reporting around this workflow to ensure users are driven to complete actions and advance the process. This workflow approach is best for matured processes that are to be tightly followed, such as when a sales rep will coordinate their follow ups with automated marketing activities. A reactive business workflow is better suited for newer processes/organizations who will rely on the user to be driving the next steps in the workflow. Instead of defining a tight timeline of activities to perform, it will work around rough indicators of when a process might be stalled, such as a sales opportunity sitting in the quoting stage for more than a few weeks. To summarize: a proactive workflow tells the user what to do, while a reactive workflow tells a user when they are probably missing something they should do. While these two approaches describe your overall workflow strategy, now we must consider how the software will guide our users through the steps they must perform in this workflow. A business can mix & match proactive/reactive workflows for the different solutions they might implement. For example a CRM sales process could be designed with a reactive workflow to enable the sales team to keep their existing offline processes, and just nudge them with a reminder when we haven’t seen updates in a while. This same organization might want to deploy a proactive workflow for their project management process, since each step of the project depends on the other activities, and follows a very standard sequence of activities throughout the process. The end-user workflow steps should be designed as activity-based or queue-based. This workflow is the classic way to manage tasks within a workflow. In Apptivo we have three types of activities: Tasks, Events, and Follow Ups. The concept is that there should always be an activity scheduled for the next step in the process. This workflow is best suited for employees who will use the system on a day to day basis, and be driven by a list of tasks in the system. It’s also suited best for users who will have activities across many different apps, as it allows for one centralized list of activities for a user. This method provides total freedom to the user. They decide what activities to create, when to create them, and when they should be scheduled. There are still methods of having some activities auto-generated, but the idea is to feed into the same list of activities a user is creating for themselves. Easier to manage activity across multiple different applications – get one master agenda. A company who is just starting to build their sales team, and getting organized on CRM. 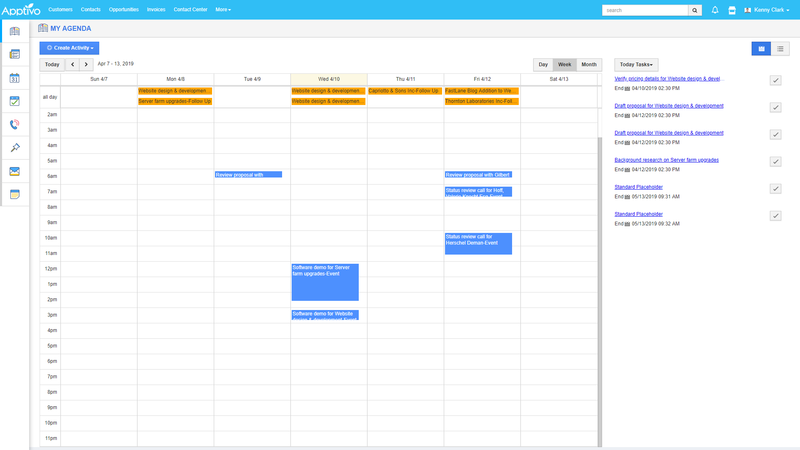 A team who relies heavily on their Google Calendar for scheduling. Tech companies who have users working across project management, help desk, and crm solutions. An enterprise sales team who works on only a few opportunities at once, and provides a lot of personal attention to each. Finance team members who will track limited activities, such as following up on overdue invoices. Queue-based workflow is where a user accesses a list of records that require some activity to be performed. Instead of having a list of individual activities, I’d have a list of my deals. The need for an activity is defined by the workflow rules of the system, for example any ticket in the “new” status requires action from our CSR team. Instead of creating a task to analyze & respond to the ticket, it’s simply known & understood that the “New” status indicates analysis & response is the next step. We’ll focus on building a queue (a view) which represents all potential statuses that require attention, providing a single list of records that need action. This method relies on structure, but makes workflows extremely streamlined. It’s great for the type of user who will be spending a lot of time in the system, and will rely on monitoring & taking action on the queue(s) they are responsible for. A sales organization with an established workflow & focus on automation. Help desk support reps who intake & respond to tickets all day. Telemarketers who cold call lists of leads all day. Finance team members who repeat a standard end of month billing activity for all customers. A project team who just needs to track basic high level details for many projects at once.